New Year’s Eve can be the ultimate celebration. If there were ever a time to go all out with party planning (other than your wedding…), New Year’s is the time to do it! This year we decided to create a boho feel for our New Year’s decor, and designed a whole printable set of accessories to go with it. 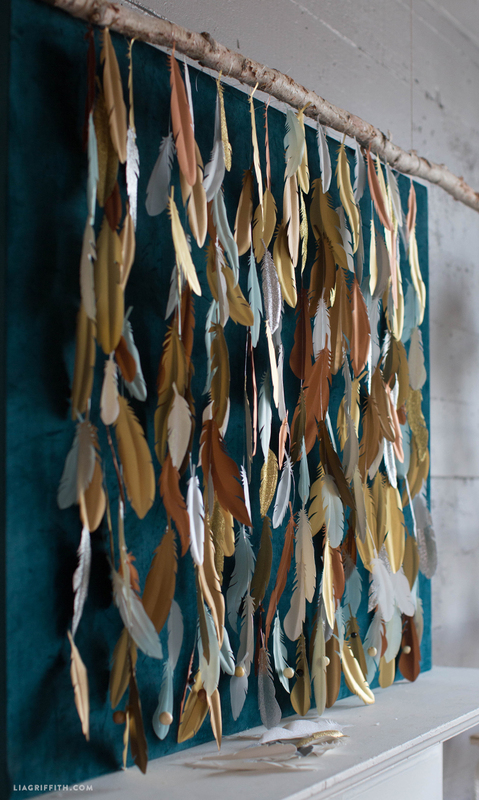 First up, we are excited to share this absolutely fabulous paper feather backdrop. It may be a bit time consuming to put this DIY photo backdrop together, but the process is simple and it can be a great way to prepare for a night to remember with your friends and loved ones. It has been a team effort in the studio to craft this project, and we encourage you to do the same with your group! Our paper feathers are one of our signature templates, but we have not done anything with feathers in a while. So it was time to bring them back with even more star power! 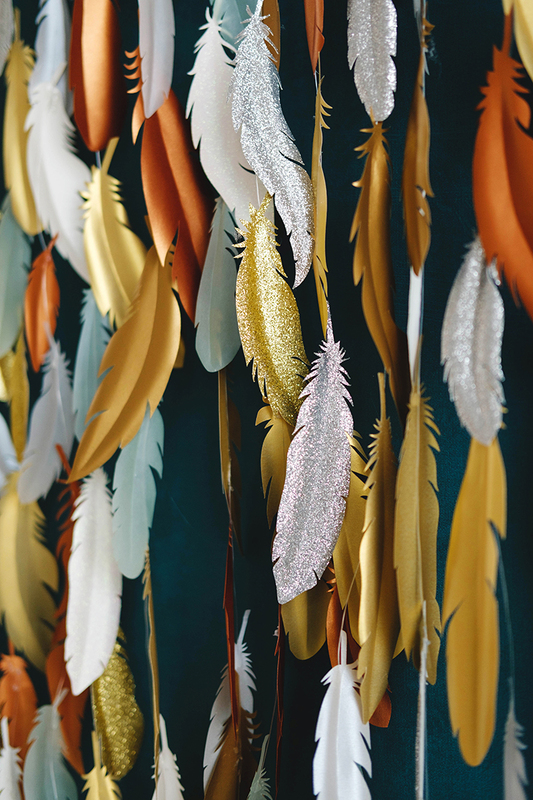 This paper feather backdrop features 8 different feather designs, 6 of which are new. 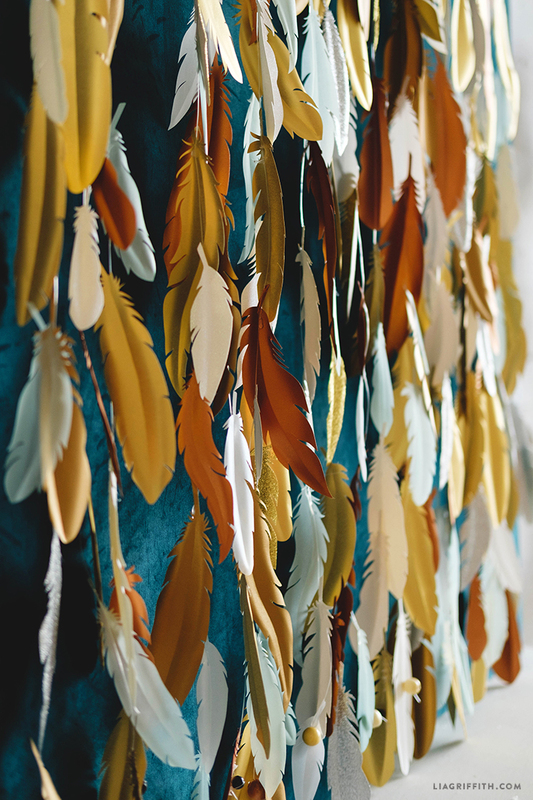 The basic technique for making your own DIY photo backdrop is to cut out the feathers onto pretty metallic papers, attach them to fishing line using hot glue, and then hang them from a birch branch. Simple! Our favorite paper for these feathers is the translucent white and metallics. We added links to some of the papers we used, but you can really use any papers or color palettes that you would like. There is an SVG version to use with a cutting machine, or a PDF version if you are cutting by hand. The templates also include score lines down the centers of the feathers to show you where to fold. 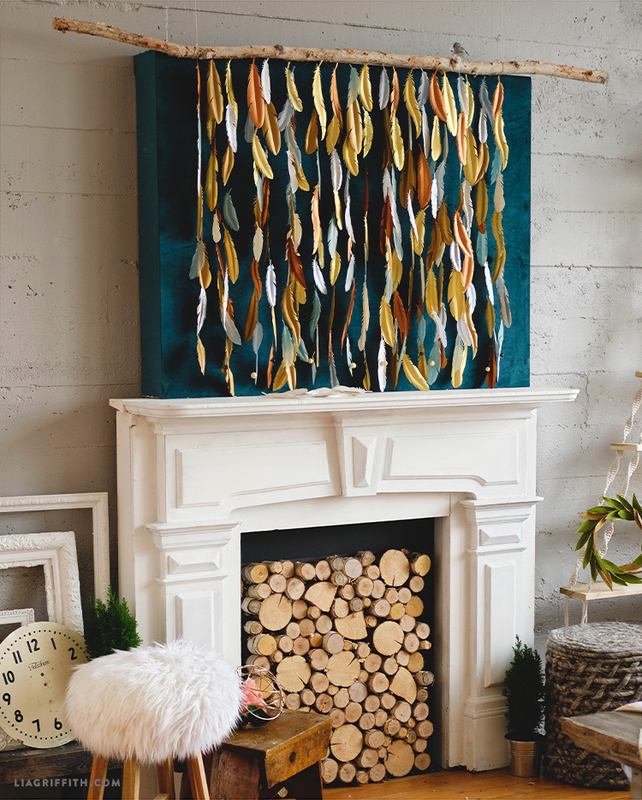 Folding the feathers and curling the edges will really bring this paper feather backdrop to life, so we highly recommend putting in that extra effort! Once you have trimmed a nice assortment of feathers, you can start assembling the backdrop. There is no real method to this, it’s all up to you. You can tightly cluster the feathers, or spread them out more for an airy feel. You can also customize how tall you would like to make the backdrop. Cut lengths of fishing line, and tie them with a simple knot to your birch branch. Then you can start attaching the feathers with a hot glue gun. OMG, this is Stunning!!! Love your creativity!!! Thank you for your kind words, we’re so happy you like the project!! Hi! Where did you get your birch branch? Amazon! There’s a link at the bottom of the post under “Shop this project”. A few questions…how many sheets of paper will this take? How do you attach the feathers to the line? Hi Amy! The amount of paper just depends how many feathers you want– you can cut 8 feathers for each 8.5×11 paper. We cut around 30-35 sheets of paper for this specific project, and used hot glue to secure them to the fishing line! Love the feathers what a beautiful idea … but wanted to ask what color did you use to paint the wall behind it such a lovely color of teal !!! Thank you, I love it, too! It’s actually velvet that I found at a local fabric shop. I’m trying to track down an online source for it and will share if I find one! Hi. Whats the name of the glitter paper?